Juice Shot – Not for the Fainthearted! I came across this recipe last year and was immediately tempted to try it out. Found on Beard and Bonnet‘s website it was originally called The Face Melter and I can fully understand why. 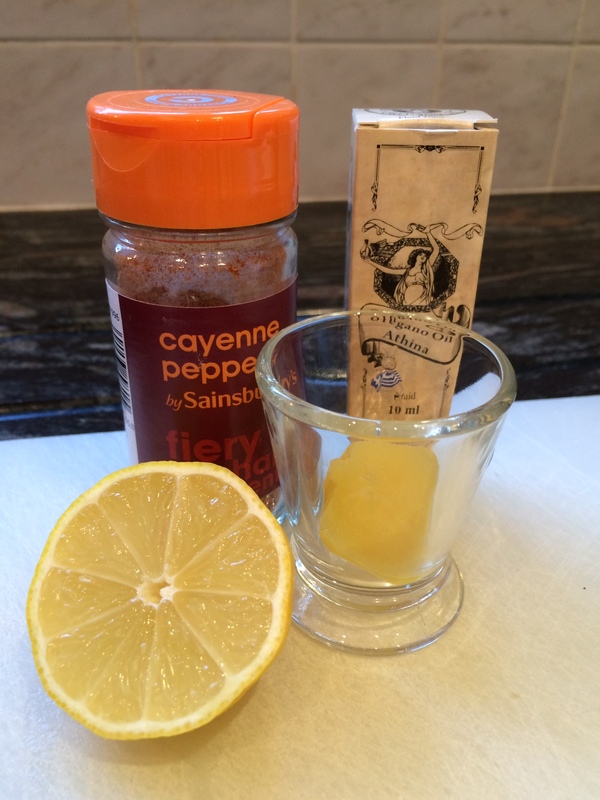 The heat from the ginger, lemon and cayenne is WOW……………….enough to chase away the nastiest of germs and when ever I get even the slightest hint of a sniffle, cough, sore throat, or just need a bit of a boost, I reach for my shot glass and make this drink. Far healthier than reaching for pills and potions, this shot is guaranteed to warm you up from the inside out. To make life easier, I bought a whole load of fresh ginger root; juiced it and froze it in small ice-cube trays. It’s perfect for this juice and I can pop one out of the tray and it thaws really quickly in the glass along with the lemon juice. Process the ginger and lemon through your juicer. Alternatively pop a frozen ginger cube out of the ice-cube tray and add the juice of half a lemon. Pour the juice into a shot glass and top with a generous dash of cayenne pepper and 2 – 4 drops of oil of oregano. Drink in one go. 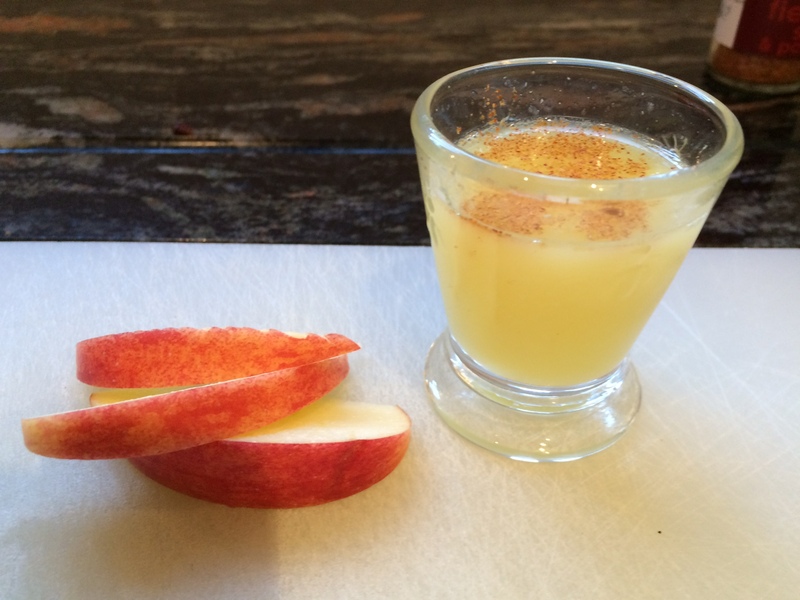 Serve with sliced apple to chew after taking the shot. Admittedly, not the best tasting shot but the afterglow makes it all worth while. If I am feeling under the weather, I fit in three shots during the day. Otherwise I have one per day to keep in top form; this is in addition to my green smoothie. This entry was posted in Miscellany and tagged Cayenne, Ginger, Immune Boost, Juice, Lemon, Oil of Oregano, Shot. Bookmark the permalink. 1 Response to Juice Shot – Not for the Fainthearted!